When a check in is due the worker will get an in app notification asking them to check in with an alarm. This feature is easy to setup and allows a worker to check-in before the monitors are alerted. 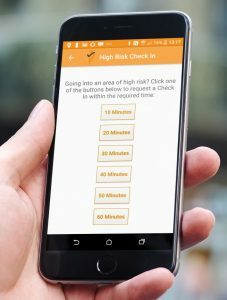 Being able to change the time between check in’s if you are going into a situation you deem high risk is important. 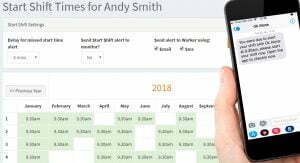 The Ok Alone app gives the worker the choice for their next, shorter check-in time. They can select the appropriate time in 10-minute increments. Once the shortened cycle is complete, the system resets to the normal check-in frequency. Simply set the shift start time using our simple interface. 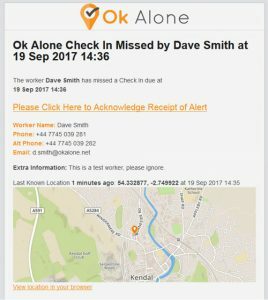 If the shift start is missed then the worker will get an sms, email or phone call reminding them to use Ok Alone. There are times when your managers are available to monitor the safety of your team. Typically, this would be during normal working hours. However, on evenings and weekends that same cover may not be available. 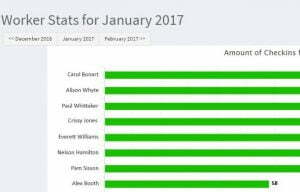 Ok Alone gives you the choice of when you use its 24/7 live monitoring and when to use your own people. This means you aren’t locked into expensive contracts that overestimate your actual need. It’s as easy as the flick of a switch to turn it on or off. 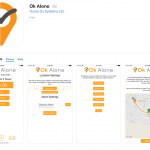 Ok Alone's lone worker app provides GPS tracking that can give worker's real time location in an emergency. 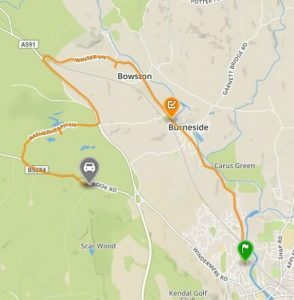 There a couple of options, with full tracking where the app uses your phone's gps to provide the most accurate location. Any app that drains the charge on your battery is not going to help keep you safe! 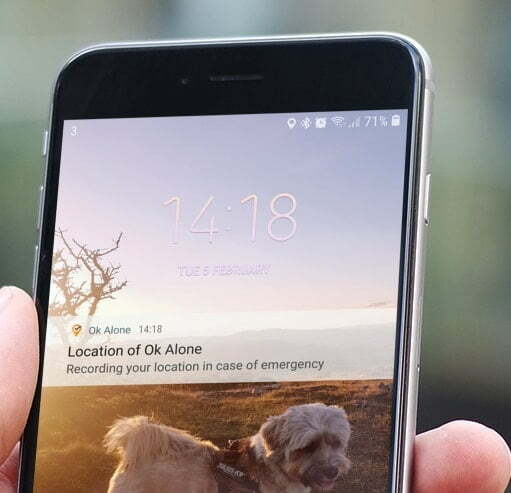 Ok Alone offers a battery saver mode for location tracking that won’t use all of your charge. It’s not always easy to remember all of the details you may need in the event of an emergency. 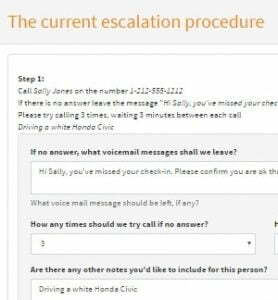 That’s why Ok Alone developed a handy tool to help you design more robust escalation procedures. By simply following a few quick steps, you can create safety policies that are complete and will be followed every time. Group workers together by department, team, shift or any way you want. 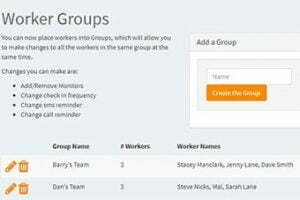 Once in a group you can easily update any instructions or details, which will automatically make changes to all the workers in that group at the same time. 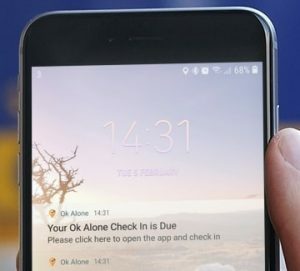 Ok Alone is an app that doesn’t need to be ‘open’ to work. The app’s feature background mode means the solution is running without it having to be constantly on the screen. Ok Alone allows you to assign one or more monitors to each worker. A typical example is a customer who uses Ok Alone’s 24/7 live monitoring service, but they want their managers to be made aware when something happens, so they make them monitors too. As soon as a check-in is missed, or a Help alarm sent, it appears on the Alerts page. You will see who has been sent a message about the issue, whether they have acknowledged it, and if it is resolved. This insight is very helpful when determining the next appropriate action. Apparently some suppliers try to charge you to update the system or send you performance reports and logs. Ok Alone doesn’t do that. 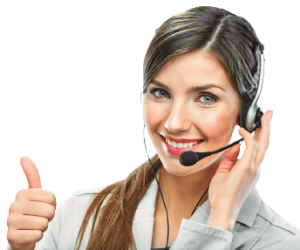 Your monitors can login and add/remove workers, change email address and phone numbers or see the latest logs and statics, all free of charge.